Yesterday, we’ve had a very high probability of breaking Tuesday’s high at 11 383. Unfortunately, the activity of market participants was so low that Dax remained idle intraday. The entire range was 70 points which is very minimum throughout the year. 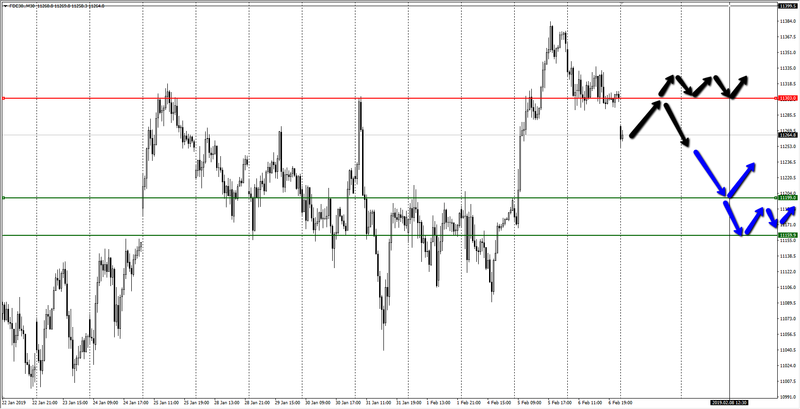 Today the price opens outside of the previous session and with a descending gap. The beginning of today’s session could be market by some bullish pressures that could stretch Dax to test yesterday’s range. Sellers could then enter at the resistance levels of 11 290 – 11 303. If sellers fail to push the price down and Dax continues to range in yesterday’s session bands, it’s more likely that the price will slow down, just like yesterday. Should sellers be strong enough, we can expect to retest the support at 11 199 or the next one at 11 159.